In this book, Jeffrey Kottler and Jon Carlson turn their well-polished therapy microscopes onto the subjects of lying, falsehood, deceit, and the loss of trust in the counseling room. What do clients lie about and why? When do therapists mislead or withhold information from their clients? What does it all mean? In their exploration of this taboo material, the authors interview and share stories from dozens of their peers from all practice areas and modalities and ranging from neophytes to established master practitioners. Their stories and reflections cast some light on this fascinating topic and will help to start a more honest dialogue about difficult subject matter. Introduction: What Is Truth in Psychotherapy? How Well Do We Really Know Our Clients? 1CHAPTER 1 — Never Ever—I Love You! 1CHAPTER 9 — Weighing in With the Truth? 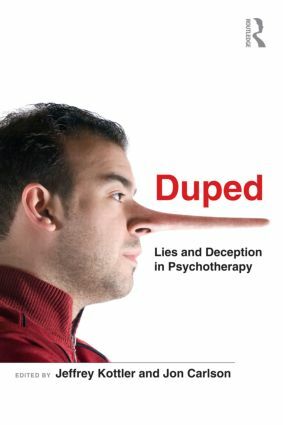 4CHAPTER 1 — What Does Being Duped Mean in the Practice of Psychotherapy?